A Polar Bear from Ice Climber. The Polar Bear (ホワイトベア, White Bear) is an enemy from the Ice Climber universe. A Polar Bear as it appears in Ice Climber. 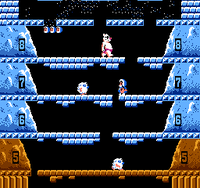 Polar Bears originally made an appearance in the Ice Climber game for the Nintendo Entertainment System. 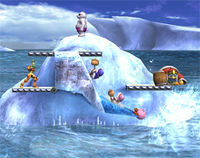 Polar Bears would appear as an enemy on the mountain that the Ice Climbers were scaling. If an Ice Climber was taking too long to climb up a level of a mountain, one would appear and will stomp on the ice to move up one level, making an Ice Climber lose a life if one was at the lowest possible level. 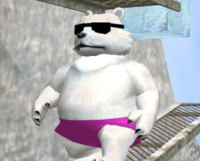 A Polar Bear on Icicle Mountain in Melee. Polar Bears serve as an enemy in the game's Adventure Mode. In Stage 10: Icicle Mountain, Polar Bears can sometimes be seen in the first part of the stage. They walk back and forth on the various platforms, and sometimes jump in order to force the screen to scroll up. They despawn when the Ice Climbers appear. While a rare occurrence, Polar Bears are among the enemies that can potentially spawn from Crates and Barrels. In these cases, it is possible to pick up the enemy with a grab, then throw them at opponents; because of the Polar Bear's high weight, it can effectively one-hit KO opponents. By KOing a Polar Bear in either regular matches or the Adventure Mode, the player is awarded the Polar Bear KO bonus, which is worth 800 points, the most for an enemy. The bonus also stacks if the player defeats more than one. Polar Bear trophy in Melee. This bizarre beast appears whenever the Ice Climbers take five during their ascents. Each leap the upright bear makes causes an earthquake and makes the mountain scroll upward. If the climbers fall off the bottom of the screen, they'll drop into a bottomless chasm. For reasons unknown, it sports pink shorts and sunglasses. A Polar Bear standing on the top of Summit. A Polar Bear appears as a background character on the stage Summit. When the stage has slid down the mountain and into the water, a Polar Bear will drop down from the sky and send the stage lower into the water. From there, it will begin walking in the background, akin to its appearance from Ice Climber, and sometimes stopping to jump and send the stage even lower into the water. The Polar Bear stays in the background when the stage regrows. However, it will be blown off the stage when it breaks off again, though it will still respawn when the stage ends up in the water again. A Polar Bear attacking Zelda. The Polar Bear appears as an uncommon enemy. Like in Melee, it regularly walks forward on the platforms, and it sometimes stops to jump in place, dealing significant damage when it lands. It has high HP and a resistance to grabs, but it is weak to flame attacks which even make it flinch. Owing to its above average strength it drops more power-ups than regular enemies. A Polar Bear can be seen teetering precariously on the icy mountain in Iceberg. The polar bear also reappears on the returning Summit stage. A Polar Bear as an enemy in Smash Run. This page was last edited on February 19, 2019, at 00:52.